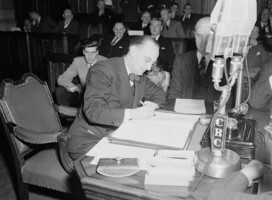 1 Caption: Mr. Joseph Smallwood signing the agreement which admitted Newfoundland into Confederation. Hon. A.J. Walsh, chairman of the Newfoundland delegation, is at the right. 2 Newfoundland was Britain's oldest colony. The people living on this island jutting into the Atlantic earned their living from the sea. This isolation helped foster a spirit of independence. That, in turn, caused her people to look on Confederation with a certain amount of distrust. 3 When Newfoundland was first settled, the people depended on fishing for their living. The island wasn't even supposed to be settled. There were laws in place to bar permanent settlements there until 1824. That did not stop them, however. 4 The laws were not really enforced by the British due to distractions. First, there was the Seven Years War, then the American Revolution. By the 1820's more than 50,000 people lived in Newfoundland. 5 In spite of the population, money was hard to come by. Most purchases were made through a barter system. The cash poor economy left most of the people near the poverty line. 6 The British established an official governor over the island in the early 1800's. An appointed council was established in 1826, and a local assembly began meeting in 1833. 7 In spite of these governmental improvements, the people wanted a responsible government, not an appointed one. At first Britain refused. The British finally gave in, in 1855. 8 Newfoundland used important tariffs to run its shoe-string government. Since much of their business was done on a barter system, there was little to tax.